While there was only one man doing the gestures in the video, Southampton FC confirmed that two fans were detained and probed by police during the game. 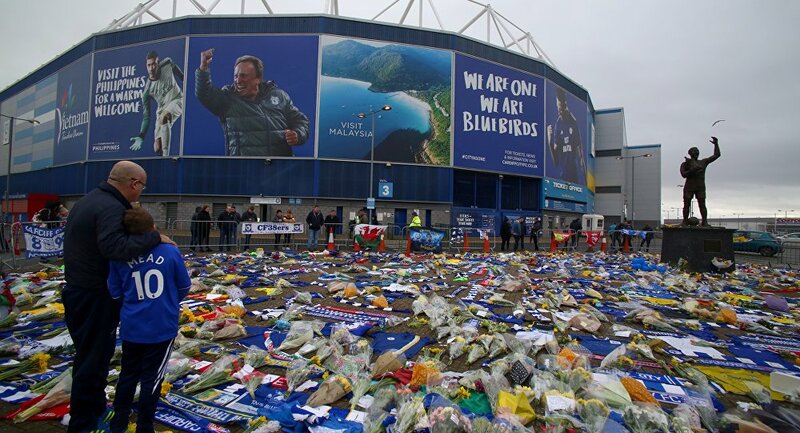 "The club will continue to work with Hampshire Police to identify any individuals deemed to have made indecent gestures towards Cardiff supporters," it pledged in a statement. — Kai (@xKaiRobinson) 9 февраля 2019 г. — lee (@leeandrew31) 9 февраля 2019 г. — Babs McMahon 💞💚💕💚 (@BarbaraMcMahon8) 10 февраля 2019 г. After roughly three weeks of searching, Sala's body was recovered on Thursday from the wreckage of the plane which was transporting him from Nantes to Cardiff. Nantes FC is a French top-flight team and Sala's previous club; the 28-year-old Argentinian flew to France after joining Cardiff City to pick up his belongings and say goodbye to his former teammates, but never played a game for his new side. His private charter vanished from radars on 21 January and was located in the English Channel late last week. The body of pilot David Ibbotson is yet to be found to be rescue workers.